It’s…Legion support? For some reason? The Clan Booster “Gears of Fate” (on sale September 30th, 2016) further strengthens the “Legion” tactics of 《Gear Chronicle》! 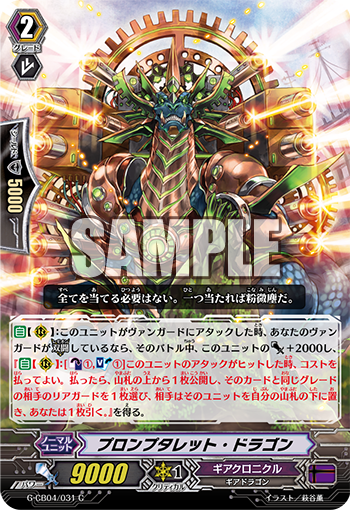 Not only does it include “Sorrow Divider Dragon” and “Steam Knight, Puzur-Ili”, who we introduced previously, but also support cards that enhance them! “Prompt Turret Dragon”, when your Vanguard is in Legion, basically serve as a base 11000 Attack! And when its attack hits, it can both remove an opponent’s Rearguard and lets you draw. And as for its removal ability, while it’s random, it doesn’t care about Grades, making it somewhat seductive. It’s quite the tricky ability as it can disrupt your opponent, so they’ll need to choose whether or not to be hit. And since you draw 1 card, you basically make up for any lost costs. And if you’re gunning for your opponent’s first Vanguard, the chances of removing it skyrocket. It’s basically an attacker who is fairly easy to use. Check out the October issue of “Monthly Bushiroad” on sale today, since it has information on the latest cards! It even introduces more cards that further support your “Legion” strategy!